Hopelessly Hopeful: When the guard refused to let me climb Charminar! Hyderabad was the first-ever city that I had explored on my own, way back in 2006. It was a fun experience, with a really funny anecdote. 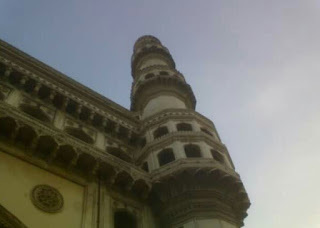 As I made my last stop to see Charminar, the guard checking the tickets refused to let me climb the minar. He was shocked to find that I was travelling all alone. Plus, he didn't basically trust me to go up the higher chambers all by myself. Despite assuring him that I had no intension of jumping off the minar, he was reluctant. He said only if someone takes my guarantee will he allow me. Desperate to now accomplish this, I requested two young girls to let me come along with them. Thankfully they agreed. The guard issued them strict instructions about me, which they actually followed through, to the extent of trying to hold my hand! As you could see, it was an uneventful visit and true to my words I did come back to the ground and showed my face to the guard too. He apologetically said, "Kya karein, loga kudi maarne ko bhi ata na," in a true-blue Hyderabadi style!